Core Bamboo is a company that sells all things bamboo. They sell bowls, trays, cutting boards, entertainment items, utensils, etc. 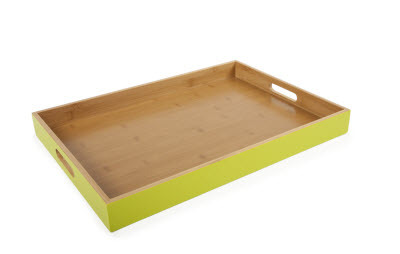 Many of the items come in bright and fun colors such as the lime tray seen above. The items are moderately priced and seem to be very nice quality. Here is some information on bamboo and why you should use it: "Bamboo is one of the most remarkable resources on Earth. As a member of the grass family, not a tree, it grows at a much quicker rate than any other wood. From start to harvest (60-70 feet tall) it can take just four years. Bamboo is naturally anti-microbial, therefore stopping bacteria from growing. It is also one of the strongest yet lightest materials around. Bamboo is 16% stronger than Maple and is 33% lighter in weight than Oak. What is probably most remarkable is its unique extensive root system. When bamboo is harvested its natural root system spreads and automatically regenerates itself." For my review, I chose the classic tray in lime. It retails for $60. The reason that I chose this tray is because I love to eat outside in the summer and I thought that this would be perfect for that. I needed something that would be simple to carry food out in but wanted something stylish also. This tray is the perfect item! It could also be used for indoor dining. After summer is over, I may use it as a large jewelry tray! This tray seems to be very nice quality and I like it a lot! Thanks Core Bamboo. Newest follower, returning the blog love!